Mayor Villaraigosa's State of the City address on Tuesday was light on details and thin on vision, failing to qualify as either a battle cry worthy of the city's budget crisis or a call to action worthy of a vision for saving the city. Instead, the crowd of friendlies assembled at LAPD's Deaton Hall were treated to a carefully seeded oratorical journey that absolved our leadership of any responsibility and concluded with the tepid admonishment "We can do better." Gone was any pretense of surveying the landscape and evaluating our position as a world class city, after all, it would have been the same as last year's State of the City address with a slight adjustment in the figures to account for any slippage. Instead, Villaraigosa jumped right in and sidestepped the traditional State of the City review of "all things we’ve accomplished and all the things we intend to do" and committed to taking on "our city budget and what we must do to solve our deficit and hone our mission of the Angels." 1) It's not our fault! Villaraigosa opened hard with a reference to the Dow, then followed with a story of his Grandfather during the Great Depression, concluding with an appraisal of the current Recession, positioning Los Angeles as the victim of these mean times, not as a city in control of its destiny. This abdication of responsibility fell far short of any "Buck stops here!" leadership and instead positioned LA as a ship adrift, a metaphor that was supported by Villaraigosa's claim that "we aren’t going to get blown off course by this economic storm." 2) Don't touch the LAPD! 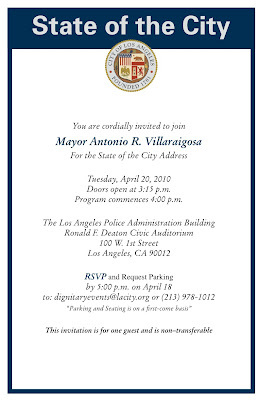 The State of the City address was delivered across the street from City Hall at LAPD HQ's Deaton Hall. Board of Police Commissioners President John W. Mack introduced Villaraigosa who was interrupted by applause only once and that was when he slipped in the claim that "Our neighborhoods are the safest they have been since the Eisenhower administration." This followed an acknowledgment the LAPD is the largest that it has ever been but no mention was made of the impact to the city's budget. 3) Prepare to pay more! Somehow the focus on the City's Budget included a journey down memory lane starting with the 2006 trash collection fee increase, the 2007 telephone users tax, and the 2008 Measure R. "Time and again, the citizens of Los Angeles have proven that they are willing to invest when we explain the challenges accurately and present the options honestly." This is the compliment that will come back soon with a price tag. 4) Plan ahead for a plan! Villaraigosa both acknowledged the obtuse and complicated nature of the DWP and yet positioned it as the vessel that would deliver us to our destination as "the undisputed national leader in green energy and green jobs." Promising a plan for transparency and efficiency in the next few months, this element of the "Budget Report" was vague enough to leave the audience wondering how this related to the budget crisis unless...gasp...the DWP would be a key element in balancing the budget, but only if the public contributed more in rates, all in the best interest of developing a green economy. 5) Partner with the private sector! City-owned parking garages, the Los Angeles Zoo, the Convetion Center, the municipal golf courses and LA's parking meters were all mentioned as opportunities to create revenue, albeit on the condition that the city services "be delivered to the public at the same, or greater level of quality." It was apparent that this transition is well underway and it came with the promise that "This is new revenue that can only be found through these partnerships and it is revenue that the city sorely needs." 6) Criticize at your own peril! The Mayor dismisses those who would debate or criticize as "pundits" and "cynics" who are responsible for the erosion of LA's civic unity. At the same time he acknowledges stepping on a few rakes in his handling of recent DWP issues and positions himself as critical of his own budget claiming "We can do better." This is hardly the battle cry of a leader who is about to ask the city staff to share in his sacrifice. This is hardly the vision of a leader who is about to ask the public to invest in the future of Los Angeles. This is far from the beginning negotiating position of a leader who is about to engage in a fire-sale of the city's assets. Villaraigosa was right about one thing, Los Angeles can do better! I attended the Mayor's State of the City address as one of the Neighborhood Council Budget Advocates. There came a moment when the personalities of those present faded into the background and I became aware of the fact that Deaton Hall was filled with LA's elected leadership including the City Council, Judges, the School Board, the City Attorney, the City Controller, the Chiefs of the LAPD and the LAFD, Consuls General and the City's Managers and Commissioners. I was proud to be counted as one of the "Fellow Angelenos" and when we stood to acknowledge the Mayor's entrance, it was because he is the leader of the Greatest City in the World. There were some keywords in the State of the City address that leave me wondering if some of the work done in the community has resonated and percolated and made its way into the Mayor's vision, such as it is. For example, when he referred to the Private-Public Partnership, he acknowledged the need for guiding principles, a recommendation made to the Mayor by the NCs' Budget Advocates a couple of weeks ago. When I heard him refer to Safe Streets, I could only hope that it was as a result of the community support for then-Assemblyman Paul Krekorian's AB766 "Safe Streets Bill" of last year. Most of all, when I heard him talk of the backbone of our transportation infrastructure, I knew that the Backbone Bikeway Network was on its way to becoming a reality. 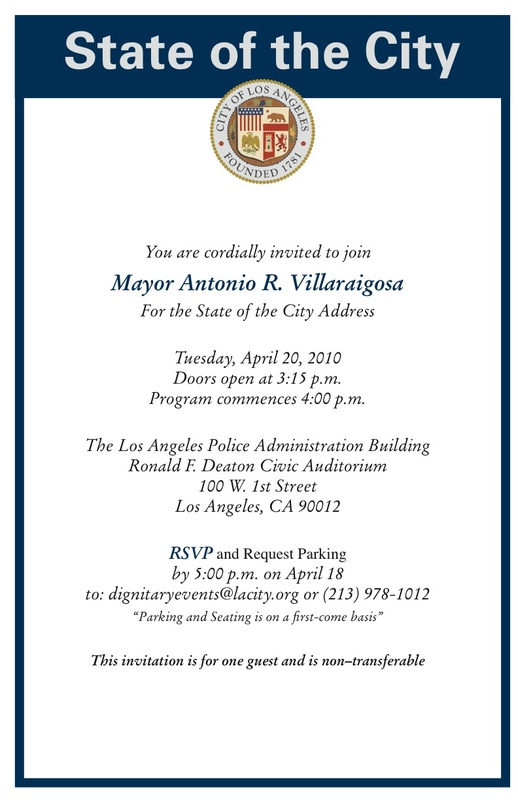 That being said, the pressure is on and this State of the City address is far from Villaraigosa's best effort. It falls far short of qualifying as a resounding call to action or a reasonable presentation of a plan that the people of Los Angeles can rally around. Those days lie ahead and, unfortunately for the Mayor, it's evident that the responsibility lies on the people of Los Angeles, not on the leadership. This one is on us!